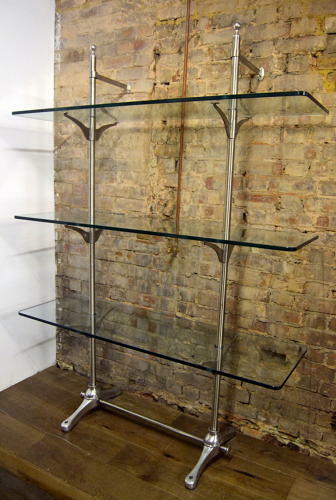 We have these fabulous 80s shelving at Binder's designed by Nigel Coates - in fabulous condition, this chrome shelving unit would be wonderful in a retail, home or office setting. The three glass shelves are adjustable in height, but we can make the unit shorter. These are top quality, never to be seen again. There are also several glass tables available to buy.